Stitching Each Day [J1625] - $6.00 : Yarn Tree, Your wholesale source for cross stitch supplies. Cross stitch pattern from Waxing Moon Designs. 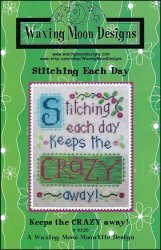 What do you think...does "stitching each day keep the crazy away?!?!" This is a design that EVERY stitcher needs! Stitch count is 85w x 108h.